Work-related noise-induced hearing loss is a preventable but irreversible condition that affects many Australian workers.  Between 28–32% of the Australian workforce is likely to work in an environment where they are exposed to loud noise at work. 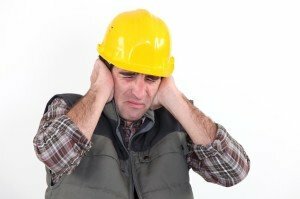  Noise-related injuries are most common in the manufacturing and construction industries with technicians and trades workers, machinery operators, drivers and labourers most exposed. Too much noise at work can lead to temporary or permanent hearing loss or tinnitus (ringing in the ears). Hearing damage can occur from extended exposure to noise or exposure to very loud impact or explosive sounds.  Long term exposure to loud noise is the most common preventable cause of hearing loss.  LC, peak of 140 dB(C). LAeq,8h of 85 dB(A) implies that over an eight-hour shift a worker cannot be exposed to more than 85 decibels. Whether this is exceeded depends on the level of noise involved and how long a worker is exposed to it. LC, peak of 140 dB(C) means a worker cannot be exposed to a noise level above 140 decibels. Peak noise levels greater than this usually occur with impact or explosive noise for instance, a gun-short or a sledge-hammering. Any exposure above this peak can create almost instant damage to hearing.  These limits should protect most but not all people. The risks from workplace noise must be eliminated or minimised so far as is reasonably practicable.  70 decibels if your work is routine, fast-paced and demands attentiveness or if it is important to carry on conversations. If you have a noisy workplace with any noisy activities that may expose workers to hazardous noise levels, you should assess the risks by carrying out a noise assessment.  check the effectiveness of existing control measures. Complex situations may need measurement to determine a worker’s exposure to noise, such as workplaces with variable noise levels over a shift and jobs where workers move in and out of noisy areas. A noise assessment should be done by a qualified Health and Safety Professional in accordance with the procedures in AS/NZS 1269.1. The WHS Regulations require PCBUs to work through a hierarchy of control to choose the measure that eliminates or most effectively minimises the risks in the given situations.  The most effective control measure is to eliminate the source of noise completely.  If you cannot eliminate the noise, look at reducing it. Remember that actions to eliminate or minimise noise may introduce new hazards, and risks associated with those hazards need to be managed effectively.  Engineering controls: These are common control measures and involve modifying equipment to reduce noise at the source or alternatively place barriers of plywood around the noise source. Barriers can also be placed along the transmission path to minimise noise levels or they can be placed around the worker to prevent noise exposure.  Administrative controls: These involve using noisy machines during shifts where lesser people are exposed, limiting the amount of time a person spends near a noise source, moving workers away from the noise source to reduce their exposure or providing quiet areas where workers can be relieved from hazardous noise sources. o where extra protection is needed above what has been achieved using other noise control measures. The risk of occupational noise-induced hearing loss is increased by relying too much on, and improperly using, personal hearing protectors such as ear muffs and plugs. According to WHS Regulations, a PCBU must provide audiometric testing for a worker who is carrying out work if they are required to regularly use personal hearing protectors as a control measure for noise that exceeds the exposure standard.  Audiometric testing must be provided within three months of a worker starting work that exposes them to a risk of work related noise-induced hearing loss. Starting the audiometric testing before people are exposed to hazardous noise (such as new starters or those changing jobs) provides a baseline as a reference for future audiometric test results. Regular follow-up tests must be carried out at least every two years. These should be carried out well into the work shift so that any temporary hearing loss can be identified. Anitech Noise Solutions can help you by assessing the noise level in your workplace and we also provide tailored advice on complying with the laws in your state. Our consultants are certified OHS professionals who can help with audiometric assessment or hearing tests of the exposed workers. Anitech Noise Solutions offers simple, affordable noise compliance solutions based on your requirements. Contact us on 1300 889 289 to have more information about noise assessment and audiometric assessment.